How Many Calories Are There in a Sabudana Vada & Does It Have Any Health Benefits? 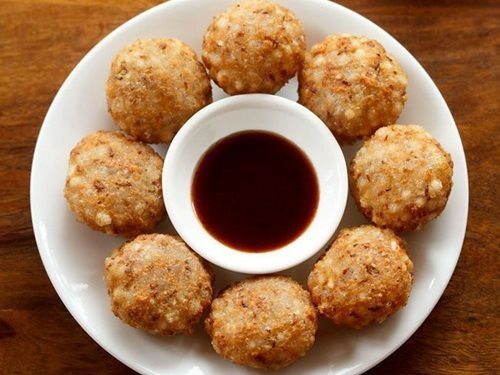 Sabudan vada is a traditional Indian snack made from soaked Sabudana or sago. It is a popular food during the religious fast periods. Sabudana is soaked for 2-3 hrs. After the granules are soften, cumin seeds, salt, green chillies, diced potatoes, coriander leaves, lemon juice and fried peanuts are added. The small balls are prepared from the mixture which are either deep fried or shallow fried and served with Coriander – Mint Chutney. When shallow fried, Sabudana Vada serves as a healthy and refreshing snack and meal option. Sabudana Vada is the most favourite food during the Vrat or fast. Sabudana Vada is consumed with curd or Coriander chutney or Tomato sauce. Sabudana Vada is a high calorie food which has more carbohydrate, fat, starch and less protein, vitamins, minerals. Adding Peanuts increases the protein content and makes it balance food. Sabudana is rich in carbs and hence it provides quick energy. You can also add finely chopped French beans, carrots, cabbages, capsicum, grated Paneer or tofu to enhance its nutritional value. Sago provides a cooling effect to the body. Hence, it is one of the best foods to reduce body heat. Sabudana is not rich in minerals or vitamins. It has low amounts of calcium, dietary fibers and iron. However, you can enhance its nutritional value by adding other ingredients such as milk for making Sabudana kheer/ Payasam/ gruel or vegetables and peanuts while preparing Sabudana Vada. Sago powder has thickening properties and hence it is largely used in various gravy dishes. Sago flour is also used to prepare flat-breads. benefits of having sabudhana vada? Next articleHow Many Calories Are There in Falooda & Does It Have Any Health Benefits?